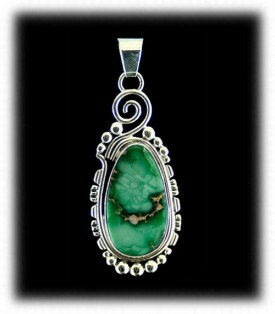 Green Turquoise Jewelry has long been favoured by many people including Native American Indians. Green Turquoise has a earthy and/or natural earth tone look - Green Turquoise Jewelry generally looks very natural when worn and matches just about any attire that one chooses to wear with it. Green Turquoise is generally from Nevada, some of the famous mines are the Royston Turquoise Mine, Tonopah Blue Gem Turquoise Mine, Damele Mine, Carico Lake Turquoise Mine, Battle Mountain Turquoise Mine and the Orville Jack Turquoise Mine. 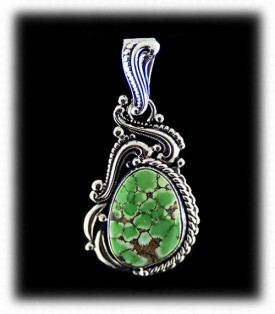 Men and women both like Green Turquoise Jewelry, however, the working man tends to like Green Turquoise in Jewelry as it can be worn without attracting to much attention. 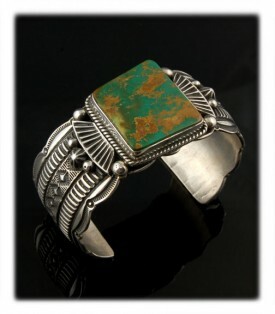 A great Jewelry item for a man is a Green Turquoise Belt Buckle. 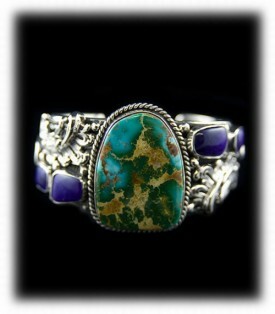 Many men will wear a Turquoise Buckle every day, a great present for a man! 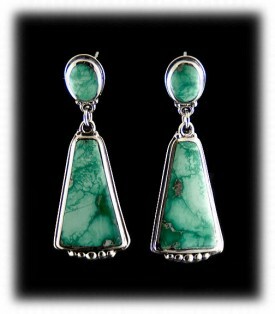 Lime Turquoise Jewelry has become the new rage in Southwestern Turquoise Jewelry. Lime Turquoise goes with about any dress colour and style and it adds an artistic look to your appearance when worn. 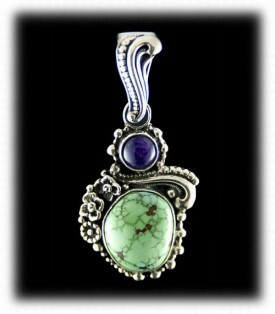 The Lime Turquoise Pendant on the left is accented with a Sugilite (purple) stone in a Sterling Silver Victorian styled design. The Lime Turquoise Bracelet on the right is also done in a Victorian style with Silver filigree work. Both of these items were made by John Hartman of Durango Silver Company. 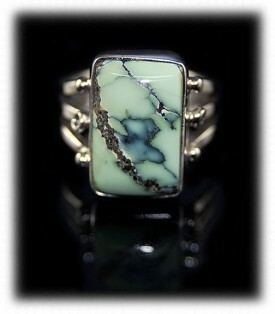 The Green Turquoise Ring above has a Manassa Turquoise Stone. The Manassa Turquoise Mine was one of the first Turquoise Mines found by the American Indians about one thousand years ago. 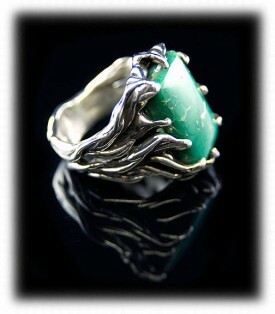 This is a Green Turquoise Men's Ring with a stamped ring shank and twisted silver wire design around the stone. 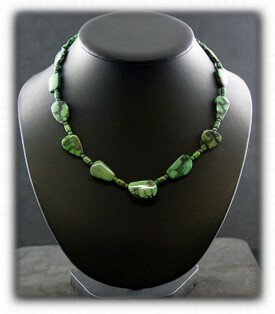 A Green Turquoise Necklace is beautiful and very natural looking. The Green Turquoise Necklace on the left was made by John Hartman with a carved silver design. the Green Turquoise Squash Blossom Necklace on the right was made with Manassa Turquoise from Colorado and is Navajo Handcrafted in a classic Navajo Turquoise Jewelry style. Green Turquoise Earrings are enchanting when worn, the green colours of Turquoise are diverse and each pair of Green Turquoise Earrings differs from all others. The Earrings on the left were made with Green Spiderweb Turquoise set with silver bezels with no design. Bezel Set Turquoise Jewelry is popular as it show off the stone. 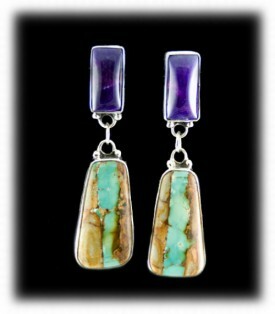 The Green Turquoise Earrings on the right were made with Royston Ribbon Turquoise and Sugilite. Each piece of Ribbon Turquoise is unique to itself, it shows the natural formation of Turquoise in the seams of its host rock. On the left is a Royston Green Turquoise Pendant, bezel set to show off the beauty of the stone. The Lime Green Turquoise Pendant on the right has a wire design with silver raindrops - it was Navajo Handcrafted. 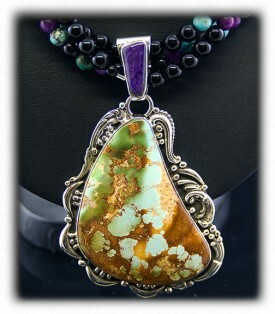 Both Green Turquoise Pendants are typical of the type of Nevada Green Turquoise Jewelry we produce. 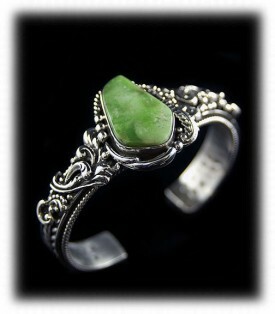 Green Turquoise is spectacular in Bracelets. The Green Turquoise Bracelet on the left features a fabulous Royston Turquoise centre stone accented by Sugilite stones. It was made with a carved filigree design and is a one of a kind. The Manassa Green Turquoise Bracelet on the right was Navajo Handcrafted. The Bracelet band was profusely stamped with an applique on each side of the Turquoise Stone. Green Turquoise Beads are a favourite by our company. We mine Turquoise in Nevada and the Turquoise we mine is green, so we tend to appreciate Green Turquoise. 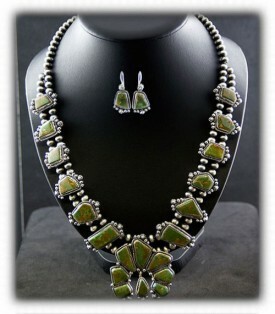 The Green Turquoise Beads on the left is called a Treasure Necklace in the Southwest as it has that appearance. A Green Turquoise Treasure Necklace made by Nattarika of Durango Silver Company is a beautiful piece of Jewelry and the Green Turquoise Beads she uses are each hand picked for its own beauty. 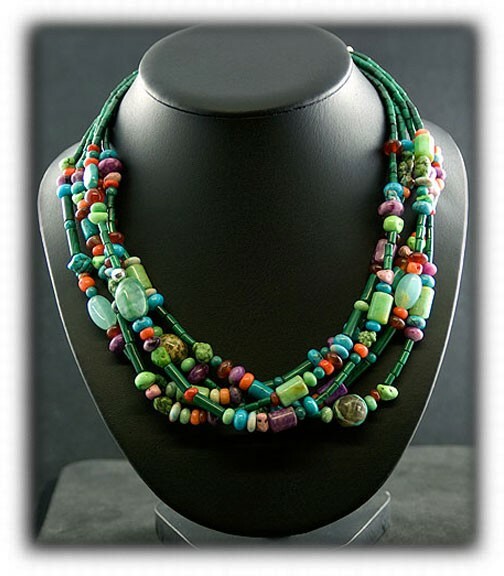 The natural lime green bead in this fashion necklace were made from top gem grade spiderweb Tibetan Turquoise. This material is very hard to come by these days. The beads are 100% natural.